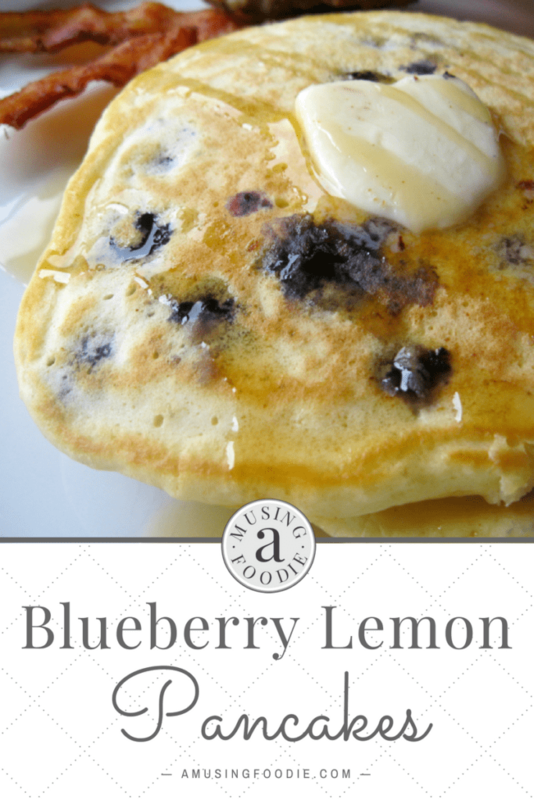 These sweet and slightly tangy blueberry lemon pancakes will become a fast favorite in your house! Pancakes are such an easy breakfast staple. Plain pancakes only take a few ingredients … probably items you already have in your fridge and pantry. Then you can easily mix things up with fun add-ins based upon in-season fruit, produce deals from the farmers’ market or grocery store, and even spices from your cupboard. Some of our favorites pancakes over the years include peach cobbler pancakes, cinnamon sugar pancakes and, of course, traditional homemade blueberry pancakes. But, with regards to a traditional favorite, I’ve found that sometimes even the slightest of additions can take that classic flavor to a new level—like with these blueberry lemon pancakes. A little lemon zest goes a long way in the flavor department and fresh lemons last forever in the fridge, never mind the fact that a bagful is ridiculously inexpensive (especially at ALDI). I find frozen fruit and berries work just as good as fresh in recipes like pancakes, but when citrus is concerned, definitely use fresh whenever possible. Beyond being so simple to make, weekend pancakes on Saturday typically means leftovers for Sunday morning, as well as easy re-heats for before school. Easier, I’d argue, than even making a bowl of cereal. 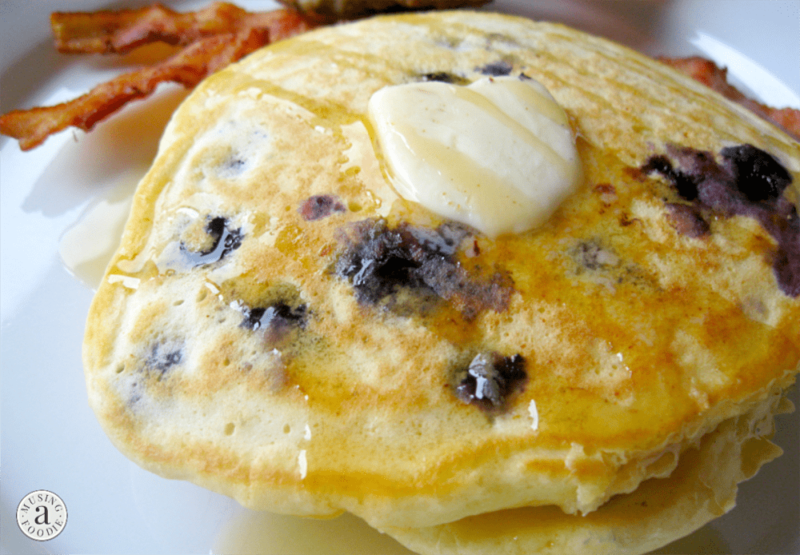 Mmm … homemade blueberry lemon pancakes. Add 1 tablespoon canola oil to a large skillet over medium to medium/high heat and use a paper towel to spread the oil around the pan, coating the bottom entirely. Let the pan heat while you prepare the batter. In a medium mixing bowl, combine the flour, baking powder, salt, and sugar. In a separate mixing bowl combine the milk, egg, 2 tablespoons oil, lemon zest and vanilla. Pour the wet ingredients into the dry ingredients, whisking to just combine. 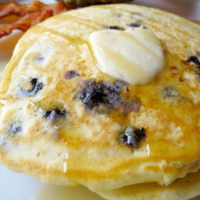 Pour the batter, about 1/4 cup at a time, into your preheated skillet and sprinkle each pancake with blueberries. Cook for four minutes, or until you see bubbles appear all over the top, and then flip* the pancakes. Cook for an additional 3 minutes, then remove the pancakes to a plate and cover them loosely with foil to keep them warm while you finish the rest. Repeat the process until batter has been used up. *I start with the pan on medium/high to preheat, but once the first set of pancakes has finished, I reduce the heat to medium. After the first set, the remaining batches need less time – about 3 minutes the first side, and 2 minutes the second side. Pieces of fruit are a great addition to pancakes. My grandmother chops apples and adds them to pancake batter – delicious! @easy recipes student – my mom used to chop up apples and put them right in the batter. Sooo good. Instead of syrup, sometimes we’d slather with butter and then sprinkle cinnamon-sugar on top.